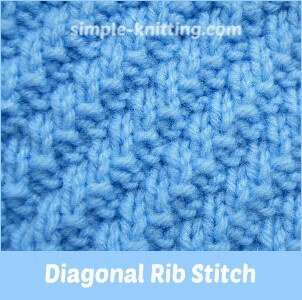 The diagonal rib stitch pattern is a little different from the traditional ribbing stitches and creates a lovely textured pattern. It's pretty isn't it? And you'll probably notice a lot of diagonal rib pattern variations as this is quite a popular stitch pattern. This is just one small sample and it's pretty simple too. Just look how those simple rib stitches are creating the diagonal pattern just by knitting your stitches over ever so slightly on every other row. The diagonal stitches almost look like steps. It's really neat how you can manipulate knitting stitches to create so many different designs. This is pretty simple but sometimes I just find knitting fascinating. The texture of this stitch pattern would make a really pretty skirt or pullover. But you can use it for anything you like. Pillow covers and blankets, scarves and hats would all be very pretty too. It is a very versatile stitch pattern. If you are looking for a border stitch pattern that will lay flat and spread out, this would be a great choice although it is not very stretchy. Make sure to knit up a swatch though so you will know exactly how it will look in your next project. It does spread out. Note: Even though the diagonal rib is made with knit and purl stitches only, please be careful and go slowly. Each row changes ever so slightly in order to create the diagonal lines in the pattern. If you'd like to knit a sample cast on 12, 16, 20 or 24 stitches. Row 1 and 2 (right side and wrong side respectively): *Knit 2, Purl 2; repeat from * to end of row. Knitting rows 1 - 8 will create this pretty pattern.